\o/ Uhu!!! Filipe, why are you so happy? A small trip to photograph landscapes, especially mountains, doesn’t make you happy? For me it works like magic! What would you say if we could also learn more about photography during the trip? No way of losing it, right? Sure! 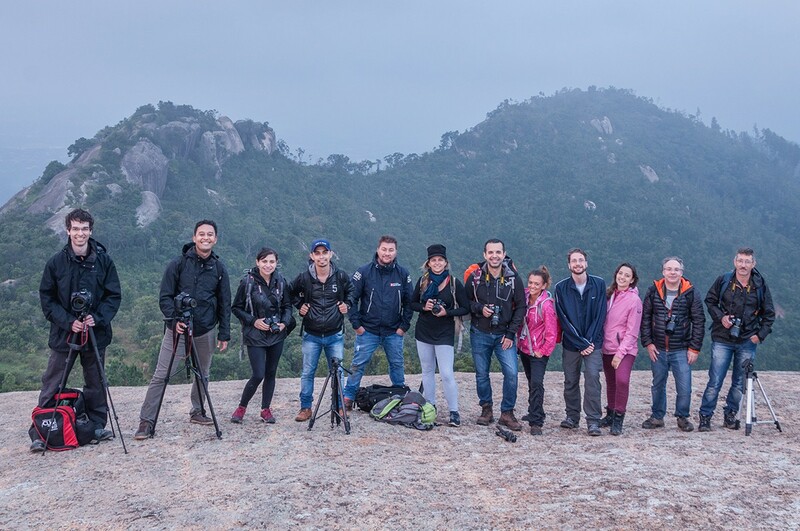 So, let’s go to Hugo Chinaglia landscape photography workshop in Pedra Grande, Atibaia, Brazil! We experienced a lot of things there and it was really great. 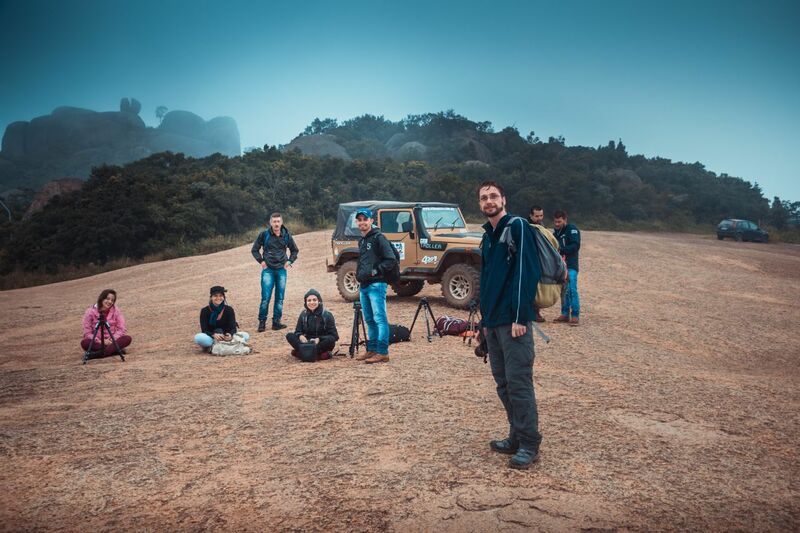 It rained, we had sun, wind, open sky with many visible stars, we did light painting, some posed with the jeeps, we went to a cave, we saw a nice view from Atibaia at night and a very beautiful and awesome sunrise with cloud inversion. This is Pedra Grande (Big Stone in English). Actually, it is big, really big. This is the scenery of the practical classes and also the only place that has cell phone reception. Photography by Hugo Chinaglia. How much is it? How can I attend the workshop? When is the next one? Click here to know! What a sunrise! Just this would have made the weekend special. 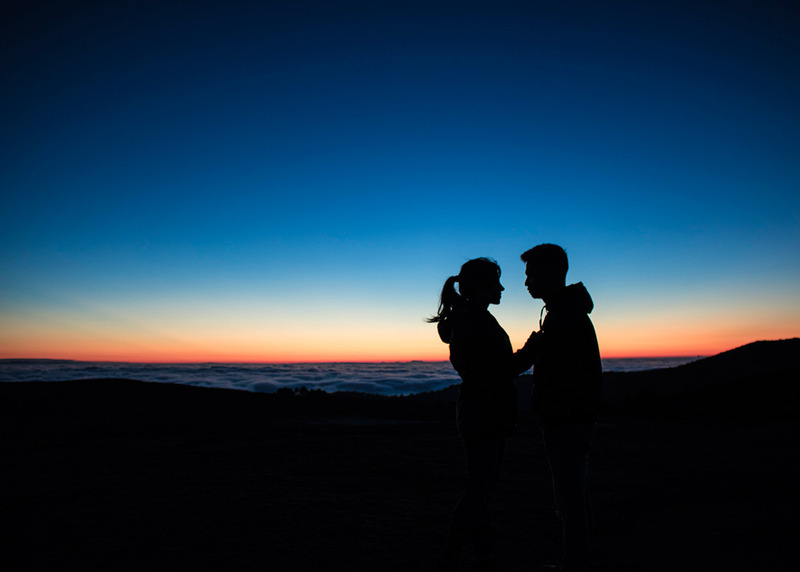 It was that kind of special moment that you forget about everything, just focus on enjoying it, you just live it, experience it, and photograph it to take that special moment with you forever. The best travel gift are not those typical souvenirs. For me, the best travel gift are the photographs showing my best moments. Those ones that make me remember everything that I’ve lived during those days and everything that I’ve done in my life to be able to be there. And this happened a lot that weekend! Let’s see how the weekend was and also learn how you can do it too! Let’s go! First, where do you need to go? It is not for Pedra Grande, there is where you will practice what you have learned. 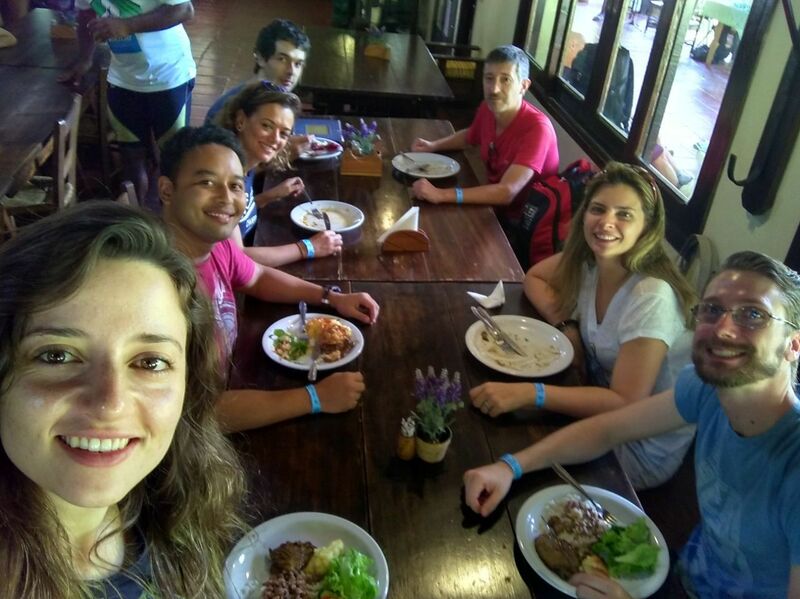 You will meet everybody, sleep, eat and have your classes at Pousada Pedra Grande :). That is the place to go. The majority of people that goes to the workshop is from São Paulo and nearby cities. So you can go by car or get a bus in the early morning of Saturday. If you come from further locations (or don’t want to get up early on Saturday), it is a better idea to come one day before (Friday) and sleep already at the hotel or in a nearby city. So, it will be easier to get to the meeting point around 8 AM on Saturday. I’ve chosen to go by bus. Why? I was just saving myself from possible headaches. The road from São Paulo to Atibaia is good, but the smaller road from Atibaia to the hotel may not be (it is a dirt road), especially if there was a big rain recently, as Hugo told be beforehand. So, as the workshop offers a transfer in a jeep already included in its price, it seems to be a good idea to use. This way I don’t need to worry about driving :). The downside is that you probably will have to wake up very early to get the bus at Terminal Tietê. My home is not near it and that day I needed to wake up at 3:30 to be able to get there on time. 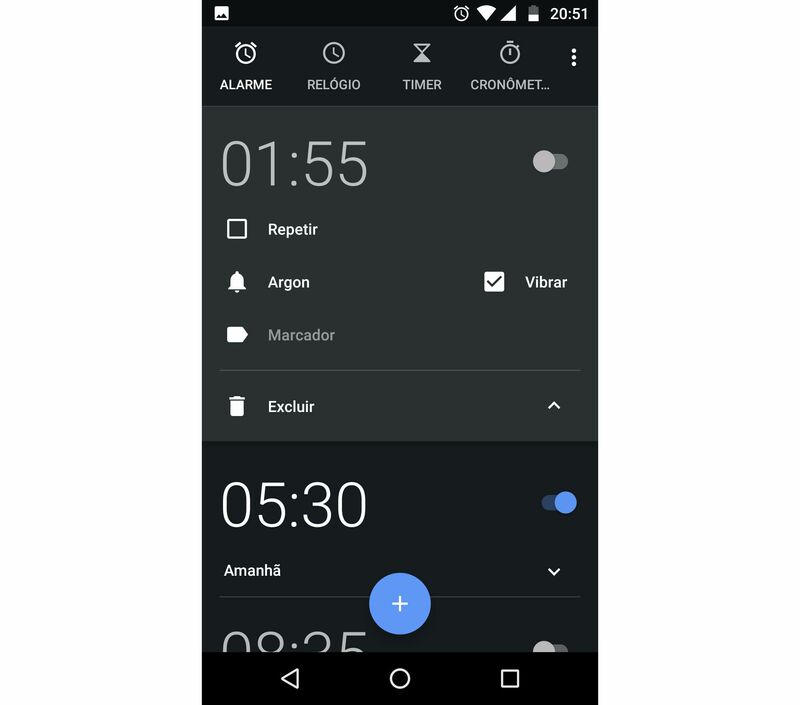 Let’s say I was trying to adjust my wake up time to the workshop hahaha, you will understand it later on… keep reading :). The bus ticket from SP to Atibaia is not expensive, it is around R$20 (March/2018) by a company called Viação Atibaia. 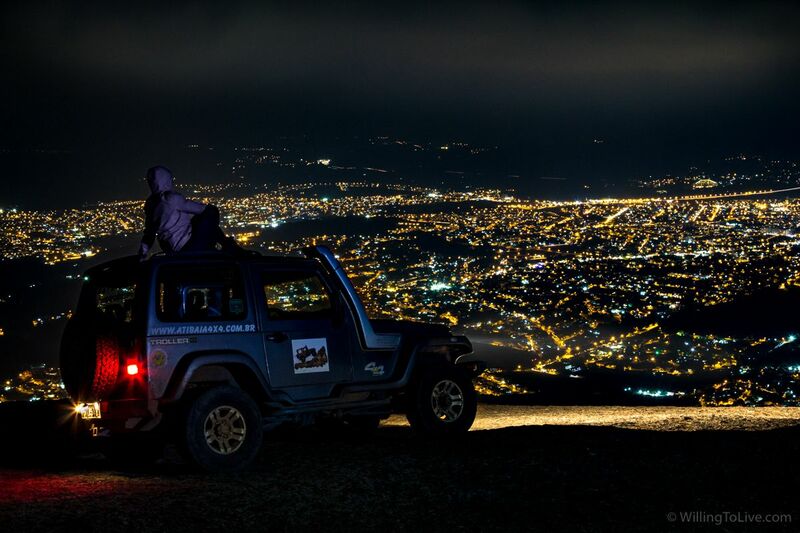 You should buy the one leaving at 6:00 AM, it will arrive at 7:15 in Atibaia and the jeep would be already waiting for you :). It is a good idea to buy the bus ticket in advance, I’ve bought it here. From Atibaia to São Paulo there is no need to buy in advance. For you that is not from São Paulo, I took about 1 hour from home to Terminal Tietê, that is about the same from Tietê (São Paulo) to Atibaia. Our city is really big. 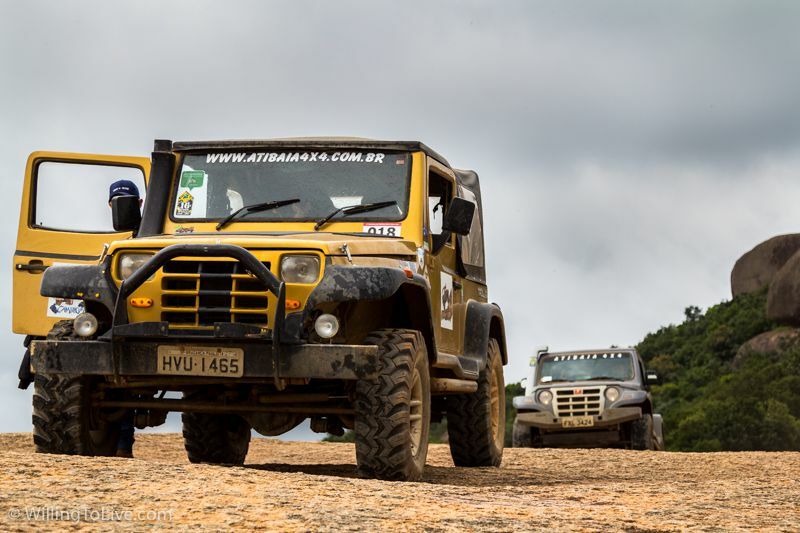 During the transfer, the funny jeep guy, Ricardo from Atibaia 4×4, told me that the road was good that day because it has been recently recovered. They do it from time to time, so between those times, the road won’t be that good. From the hotel to the “Big stone” we go by jeep (already included in the workshop cost). City cars can get there, but some of them get damage trying to do it, the road is not that good. 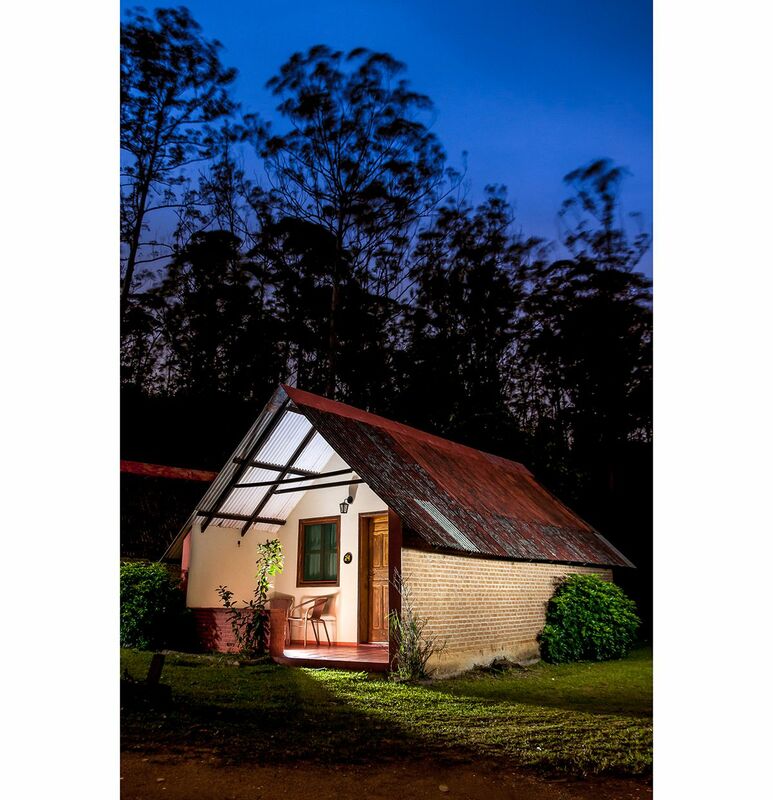 For this workshop, we stayed at Pousada Pedra Grande. I liked staying there. The breakfast was really good, we also had great lunch and dinner. The room we had for the workshop classes was good too. The hotel was not closed for our event. Actually, on Sunday, there was another event happening there too. The hotel is too big to close just for us, we were in a group of 12 people. As I’ve just said, that place is big, we went by car from where we had our classes and meals to our chalet. It was not that far away, but by car, it was much faster. 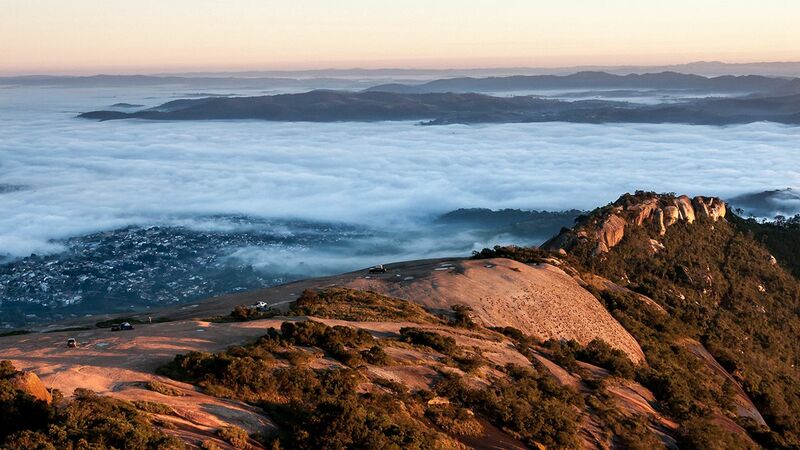 So, we can spend more time at the “big stone” (Pedra Grande) and not walking inside de hotel. The road to the chalet could be better, it has a lot of holes and irregular terrain. With typical city cars you need to go slowly, but you can do it. Photo by Paola Buoro during one of our meals. Sometimes a selfie is worthwhile :). You can bring more people with you that won’t participate in the workshop, like your family, for example. While they enjoy the hotel (there is a swimming pool and other stuff for them to enjoy), you can learn more about photography and also practice it :). Before the workshop, you can choose if you want to stay in a camping area or in chalets (you don’t need to worry to do it by yourself, Hugo does the reservation for you). The hotel also have some options of chalets, I’ve chosen the cheapest one and it was good. I just want a safe place to store my things, a good bed, and also be able to take a shower with hot water. If you want to do so, you can also share the chalet with more people. Usually, we find really nice people on this kind of event, so I thought that it would be a good idea to share the bedroom. Photography by Hugo Chinaglia. One of the hotel chalets. And it really was. I’ve shared with one more person that turned out to become my friend during the workshop. Besides saving a little bit of money :), Daniel Yamaoka is a really nice guy. He even gave me a lift back to São Paulo, note that he is not from São Paulo, he is from Santos. Really nice guy, thanks, Daniel! Just one more thing, the staff of the hotel was also very nice to us. They even helped us with an extra radio to communicate with them in case it was needed. They also said that they have snake antivenom in case anybody was bitten by a snake. It seems that they have a good infrastructure there to help us. Add your clothes and personal items too. 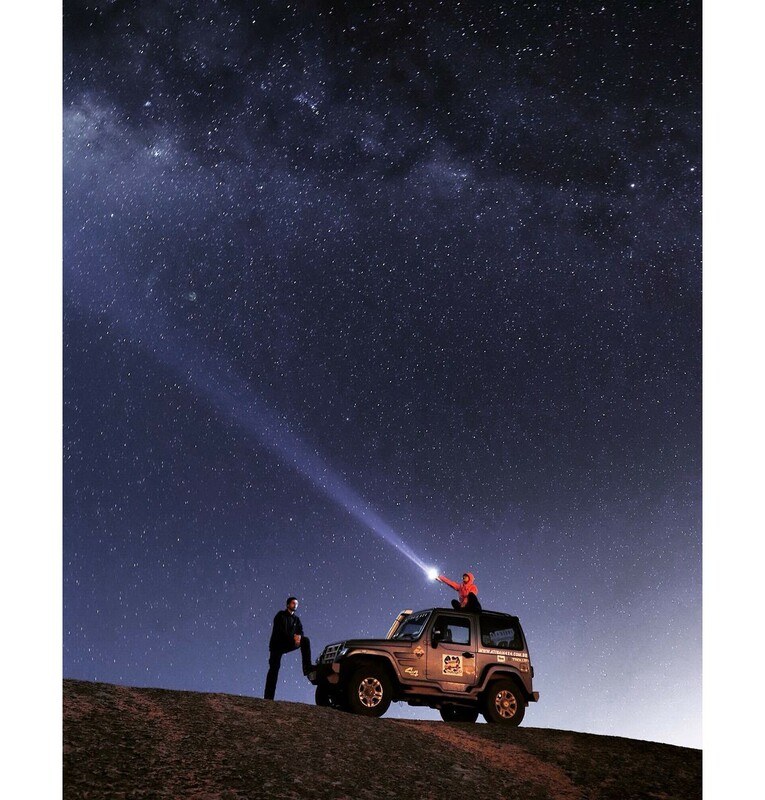 The flashlight is important for moments without natural light, I mean before sunrise and after sunset. Remember to charge batteries and clean your gear. It can be cold at Pedra Grande and also very windy. A Jacket, gloves and a beanie hat will help you a lot. Always go to this kind of photowalk prepared. If you don’t, you won’t be able to enjoy it and there is also the chance of getting sick. Regarding my snack, I took it easier this time because I would sleep just one day there. So, on the first day, before leaving home, I made a whole bread with chocolate that can be in my bag for quite some without spoiling (for the afternoon of the first day). And I also took mixed nuts (walnut, almonds, cashew nuts, brazil nuts, raisins) for the morning and afternoon of the second day. Self-portrait of Daniel Yamaoka. The light partially lighting Daniel and the clouds in the background are so nice! Soon we will get to this moment of the workshop. See you next week! Actually, the workshop starts before the first day. Hum? How is that possible, Filipe? Easy :), Hugo creates a WhatsApp group just with the people that will attend the workshop. This group is useful to help with the logistics before the workshop, it is also a way to exchange photos, ideas and questions after the workshop. The group was also useful to break the ice. So, people introduced themselves, we talked about the equipment needed and shared checklists. We arranged meeting points for lifts and so one. 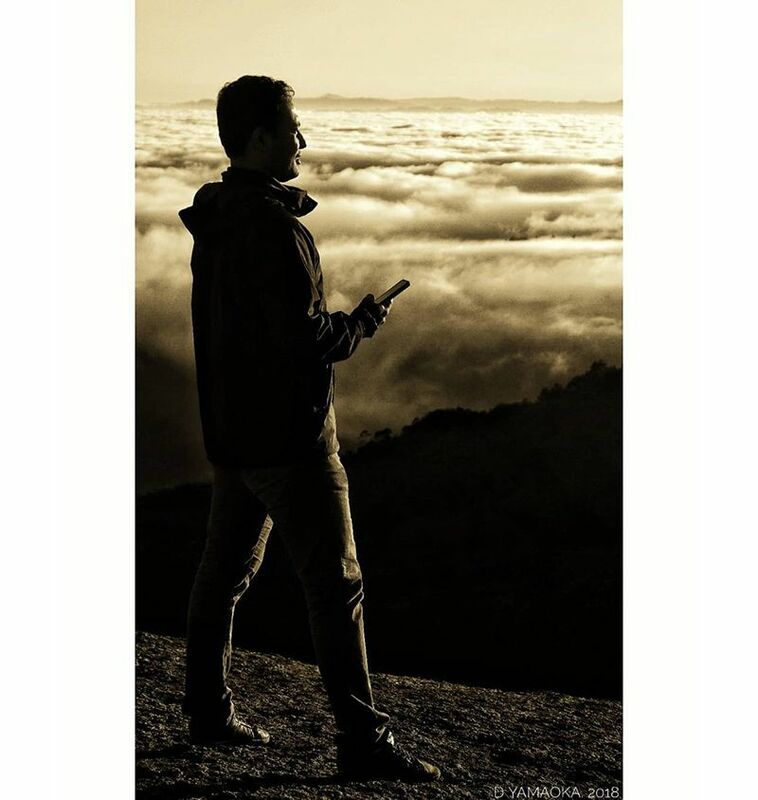 As a bonus, Hugo also organizes some photowalks in São Paulo and he just calls their students through WhatsApp. If you like emails like me, Hugo also sends a few official emails with everything you need to know to have a good workshop. We started the workshop laughing, hahahaha. I’ll tell you how it was. Just after everybody has arrived, we went to the chalets to leave unnecessary bags there. At that point, I’ve just met Daniel Yamaoka, the guy that I would share the chalet. I went first with Ricardo (jeep guy) and Daniel followed us with his car. The chalet’s key was with me, so I opened the door. As soon as I started to open it, we saw a double bed… hum… Then I thought to myself: ow boy, I think the hotel has made a mistake, hahaha, we are not a couple. After that, we started to talk. He told me about his travels, I told a little bit about mine in Peru. Really awesome conversation! To make it even better, when we were coming back in his car to have breakfast with the rest of the group, it was playing Pink Floyd :). He likes it and me too, \o/. We explained what just had happened and everybody laughed with us :). Photography by Alessandro. Our group already at Pedra Grande during our first day. The workshop was starting in a very good way and during the breakfast, it became even more clear that it would keep like that. The people. This is a very important part of a workshop and a photography expedition. I love to do my photowalks and travels alone too, but when we are in a group, it should be really worthwhile and rewarding. And it usually is for this kind of event, really interesting how photography and this events can do it. It is amazing how we meet really nice people. Everybody is really aligned and have similar interest and objectives. I think it is like “freedom time”, everybody is happy, feeling good, wanting more, wanting to learn, to live, enjoy their moments, discover new places, photograph and create their art… Well, can I just say willing to live? ;) haha. Interesting life stories have appeared during our breakfast, like the one of Daniel Tavares. I hope to able to bring him on our blog in the future to tell us how photography changed his life and the new values he adopted for his life. Very inspiring and relatable. We also talked about a variety of things, but I won’t tell you everything here because it is too much :). I will finish this section with a quote from our conversation. I don’t remember who said it, so I won’t guess the credits for that person. I think you can guess that we are talking about photography and also traveling. But this idea can be applied to much more things in your life. The initial perception of the good group became even more pronounced when our class started. Hugo started it by asking that each one of us talked a little bit about why you were there and your expectation for the workshop. Incredible how the essence was the same in spite of some differences. This also helped to bring the group really together. Hugo also told us why he was there and what he wants to his life. Go for it, Hugo! Hugo’s class is very flexible. It is not a class that is already planned and it doesn’t matter who is listening to him. It does matter and he gives more or less detail depending on how comfortable everybody is with the topic he is explaining. This makes the class also interesting for more people, I mean, people with different levels of knowledge. For our group, we were more used to basic photography concepts and some needed to learn more about the landscape photography techniques. So, he spent less time on the basics and spent more on the landscape part that even included star and star trail photography. After that more technical stuff, it was time to talk about composition. If you are more used to those technical concepts, this part of the class will probably be your favorite one! Hugo’s background is design. So, I’m sure that this helped and also complemented his knowledge about this topic and the way he teaches it. I really liked what he said. I think it is pretty similar to the way I think about composition (things that I already know and humbly think are a nice way to go), but I also could learn new stuff. We also reviewed some photographs with him during the class. For the second one, we discussed what time we would get at Pedra Grande to shoot stars. Based on the feedback of one of his students, we decided to go earlier than usual so that we would have more time there. Hugo really encourages feedback from his students and he really takes it into account. Not what you have just read, but, for example, the big and nice room we were having our class was a result of past feedbacks too. 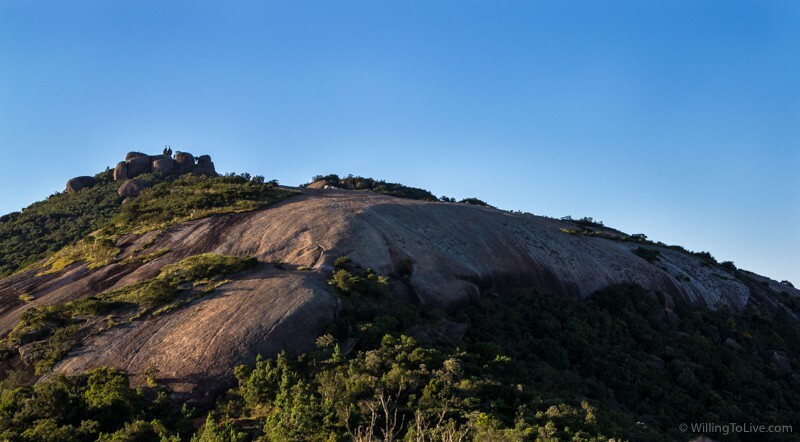 For the first photowalk, there are two options to get to the Pedra Grande. You can go by jeep or you can get there walking on a trail. The trail is about 1 hour long, low difficulty (you don’t have to climb or any other more “radical” stuff) but it is physically demanding. It is more about the hike, there is no particularly interesting view to photograph during it. You can choose, if you don’t want to walk you can go by jeep. For our workshop, we were also given, for the first time, a new option. A trail not to get to the Pedra Grande, but a trail to get to another point of it. This one is made after getting in Pedra Grande, it is more difficult and risky, but we decided to try. So, as we would do this second trail, we got there by jeep. After we got at Pedra Grande, a big storm was coming! You can see it below. So, trail canceled. Next day we would try it again. When I say it was coming, it really was. First, it was really far away and we could walk and photograph normally. Then, just some drops were falling on us from time to time, nothing to worry about. But the girls have already worn their jackets and protected their hair hahahahahaha. But after some minutes, it started to get windy…. We started to position our tripods and tried some shots. 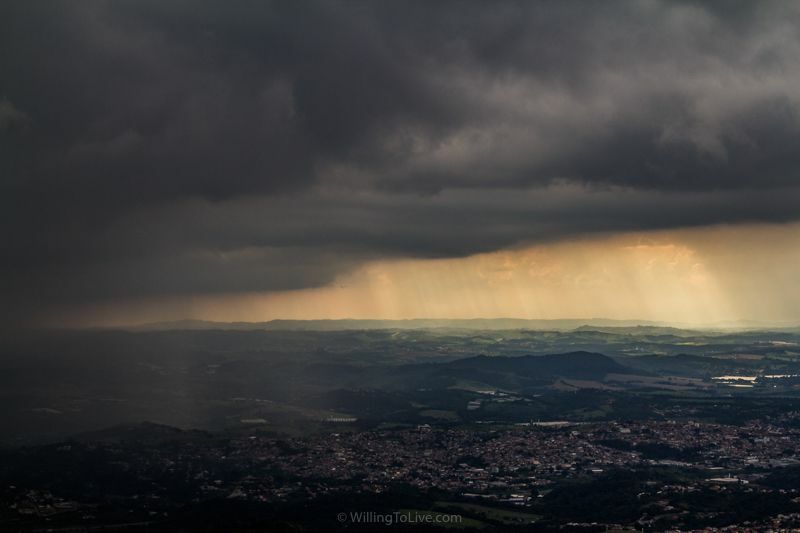 But the weather was very unstable, the light rain came again, the wind was coming and going. The group as a whole was having difficulties to have a good time there. Now what? Who could save us? Guys, there is a little cave near there. Do you want to photograph there while the weather is not good here? We can come back here later on. \o/ A cave! Sounds good! I had no idea that there was a cave near there, awesome! We went there and have a good time photographing it! The cave is small, but there was space for everybody to get in and photograph. The most important thing that moment was to avoid rain and start to practice what we have learned. The outside light was coming from one side and lit the rocks and the water inside the cave. We tried a few compositions and Hugo posed for some shots. Hugo also went student by student checking if they have any questions or difficulties :). Filipe, we were inside a cave… photographing it. What were you thinking about while you were there? I paused to see what he would say. Where is the world that moment? I have no better comment to make. He nails the point. 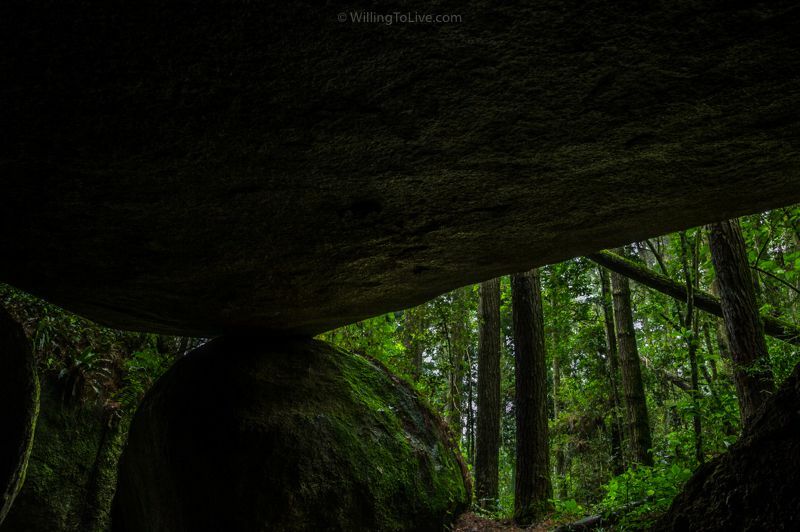 Photography by Daniel Tavares looking up near the cave. Always remember to look up. This time I have forgotten :(, luckily we photowalk in groups :). Can you see? There is no bad time when we want to enjoy. We find a way to do it. Even if there was not a cave, we would have found a way to enjoy our moment there. I have no doubt about that. It may not be the thing you have anticipated, but it is always possible. I’ve already talked about expectations in this other article. Then, we returned to the stone and the weather was much better. We took a group photo and there was also very beautiful colorful clouds. We were also free to explore the “big stone”. The sun had already set (behind the clouds) and the night was coming. I tried some more photos and when it got dark, we could see Atibaia fully illuminated. Hugo called the jeeps and his wife, Paola (like him, she is very nice, calm and helpful and she was there supporting us so that we had a good time during the workshop), gently posed for us over the jeep. I’m not used to this kind of “not spontaneous” shots, but it was nice to do it and it was really fun. In total, we stayed at the stone and cave for more than 4 hours :). After that, it was time to have dinner. Exactly, we woke up very early. 1:55 AM to be precise. We just got ready and went to our meeting point. 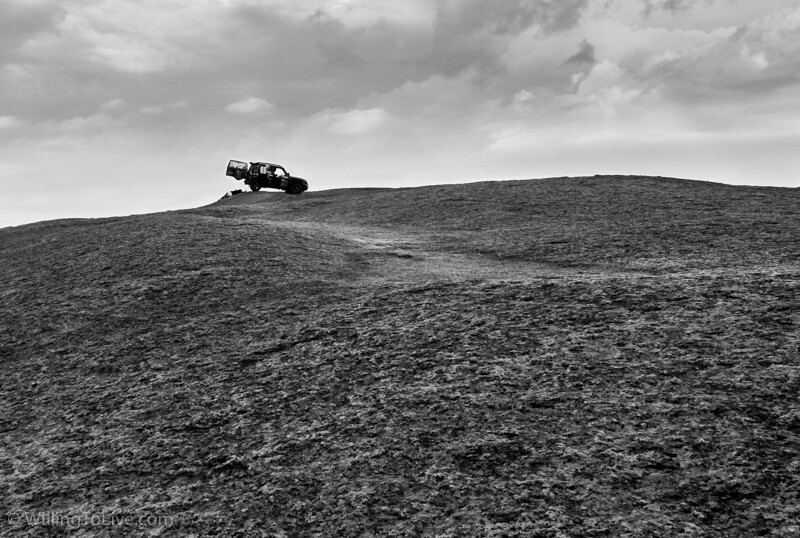 There, we waited a few minutes for the jeep to come and we went to Pedra Grande. Breakfast would happen after our photowalk. 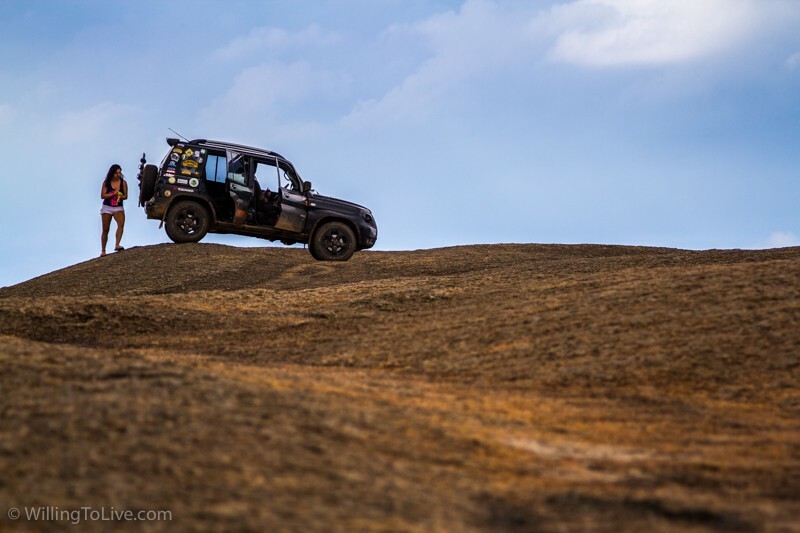 Note, the only way to get up there is by jeep, no trails this time. To arrive that early in Pedra Grande is a good idea to be there in a big group like we were. After we have arrived, we started to prepare our camera and tripods to photographs the stars. This is the time that you will use your flashlight. But I’m getting used to dealing with the camera in the dark. I used the flashlight to attach my camera over the tripod and after that, it was possible to turn it off and keep using the camera. Practice :). That day the moon was there, it was not a full moon, so it didn’t bother us that much. Actually, it is even possible to use it in your composition when taking the shoots. 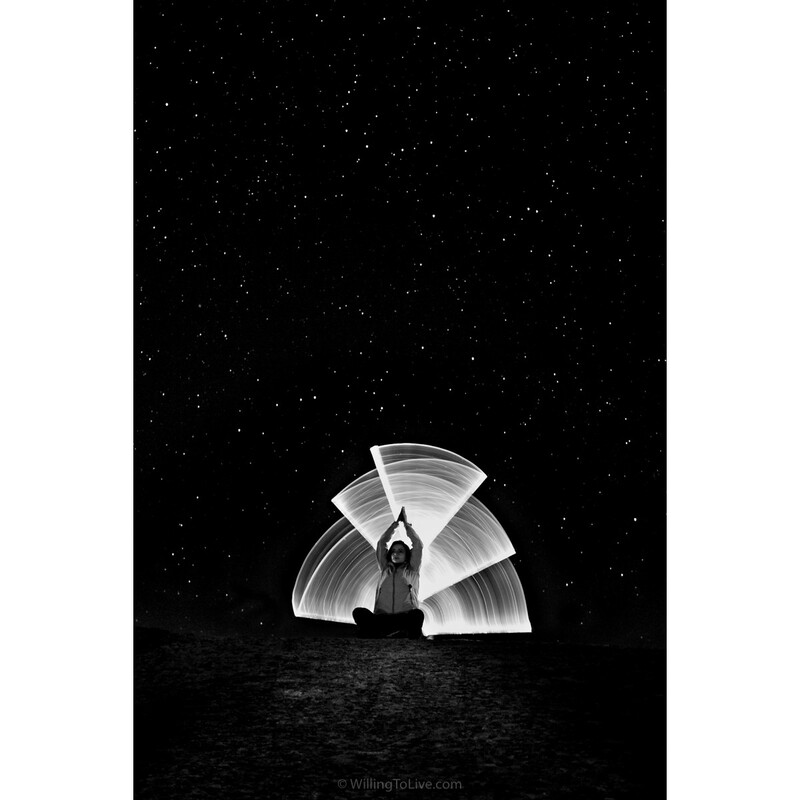 Photography by Daniel Tavares taking advantage of the moon in his composition. We started photographing “free style”. For this day, I tried something different than my last experience trying to photograph stars. I wanted more light hitting the sensor to be able to use a lower ISO. So, that day I tried to use a f/2.8 lens instead of my wide lens that is f/4.5. Yes, it can provide me a little more than one stop of light \o/, but it’s focal distance is longer, 40 mm, while the other one is 10 mm. For the purpose of shooting stars, this is not good. Because the longer the lens the shorter the exposure time to keep stars like dots and not like trail (rule of thumb: 500/full frame equivalent focal distance). So, less light hitting the sensor. The aperture size was bigger, but with the shorter exposure time, the results were similar to last time. If you do the math, you will see that the bigger focal length “costs” 2 stops of light compared with the 10 mm lens. So, actually, it should have got worst. Maybe the shorter exposure time introduced less noise (around 8 seconds instead of 30s) and it helped. Whatever, I tried to do my best and got some photos a little different than the rest of the group because of the 40 mm lens, usually, you do this kind of photography with a wide lens. It was fun and I enjoyed photographing with it anyway :), that is what matters most. Later, Hugo also came with some light painting ideas. Some more planned shots for us :). 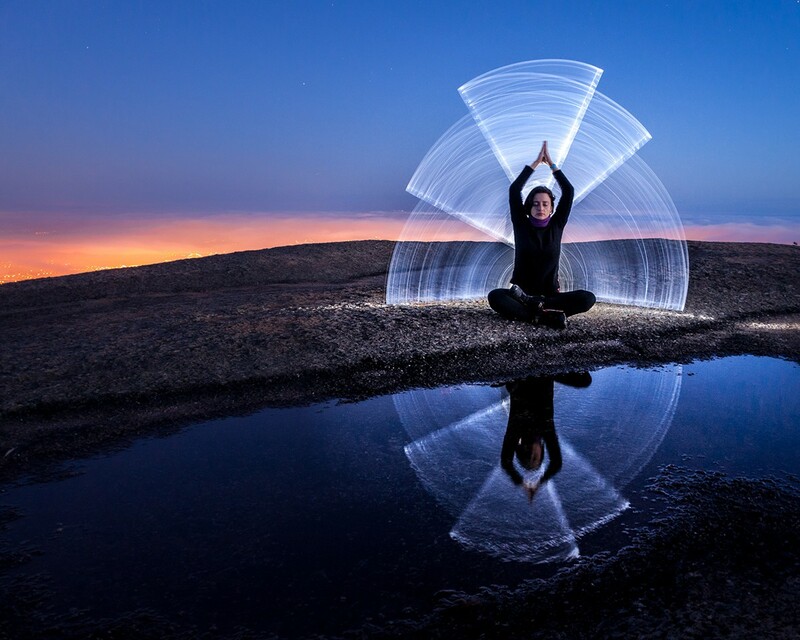 He created something like a lightsaber that he moved it while the photograph was being taken. With the help of Paola, my result was this. 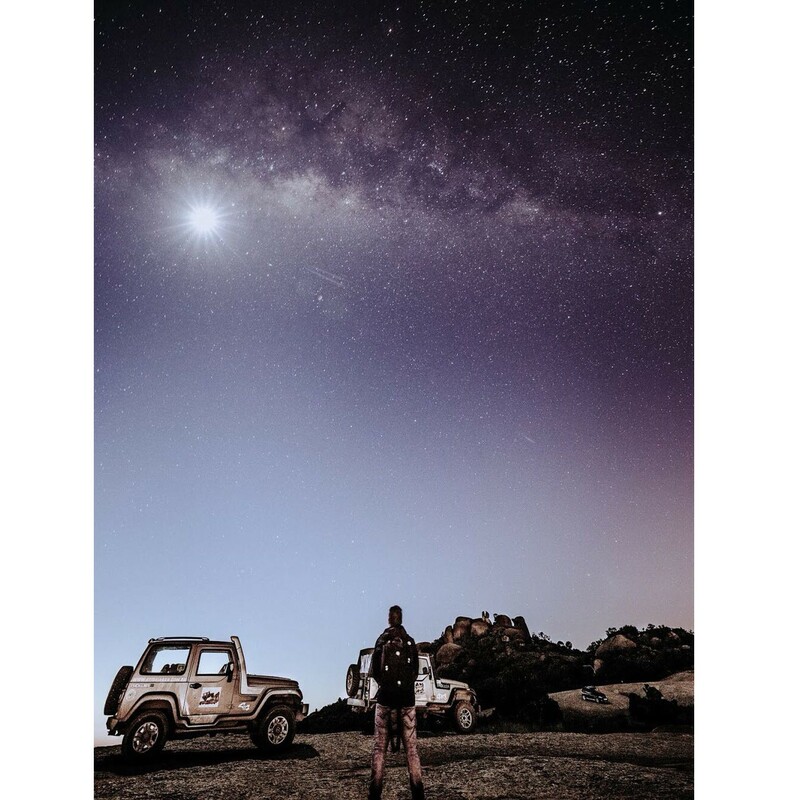 After this moment, they also posed for us with the jeep and with a flashlight pointing to the sky (you have already seen this image above). Stars are nice and I can see that people love it, hahaha. But the sunrise was coming, for me, it was the epic moment of our weekend. I don’t know exactly, but maybe the fact that we were there for some hours before the sunrise photographing the stars made it even more special. We tried to get our shots, it is not easy at the beginning, due to the low light conditions. It is like everything stops and you deeply live that present moment. I’m not particularly worried about taking photographs, they flow naturally… I just want to live and experience that moment. Just playing with the light that is rising. That is when the magic happens. It is why I’m doing what I’m doing. And that day it happened and I felt it. I was just lost in that beautiful and rewarding moment. A moment that was easily worth the whole weekend. 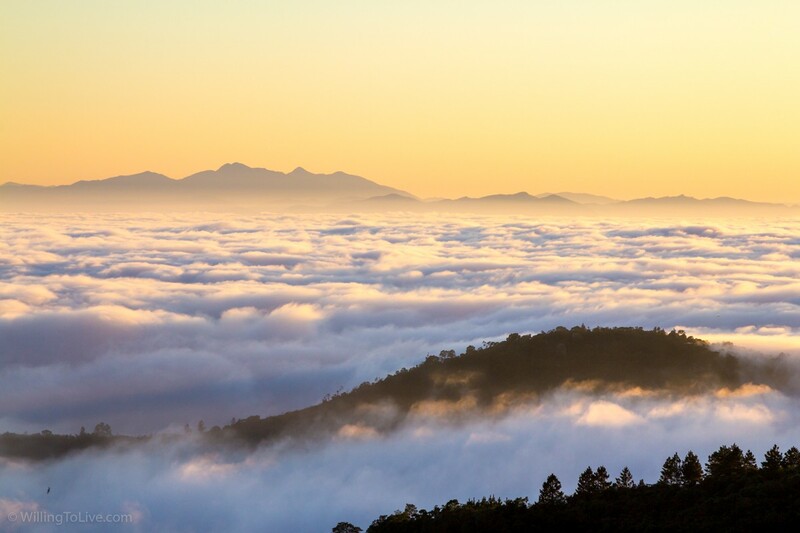 Like Daniel said above, the mind is focused and we are just experiencing (not thinking about anything else) that amazing and really beautiful sunrise with cloud inversion. While that, photographing it and transforming it into lifelong memories. It was so perfect. But, there was a puddle there. There was a puddle on our way up there. Do you know that a puddle is one of the greatest photographer’s trap? Photography by Hugo Chinaglia. Backstage of one of the puddle photos. First, because it works like a bait. 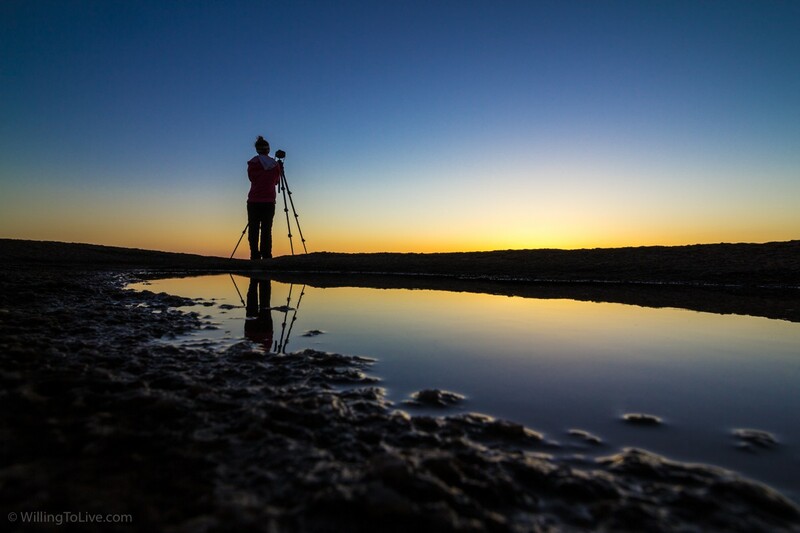 Almost every photographer wants to use the puddle to generate some interesting reflections and to do it properly, you will spend some time there composing your shot. Second, because it is not easy. And sometimes, you end up just photographing the reflection instead of using it to compose your photograph. I like it. I think the puddle is not just creating something beautiful, but it is also contributing to the composition. 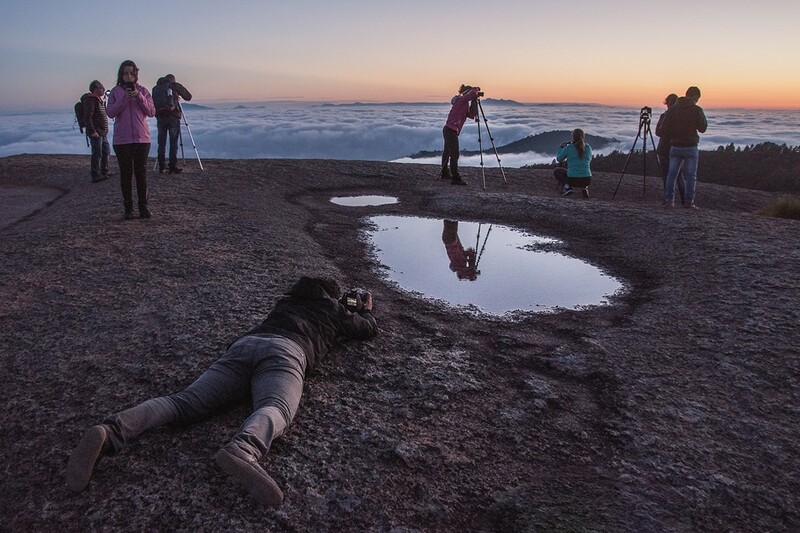 When you look at the picture, probably your eyes start near the bottom right and keep going through the puddle, because it converges to where Vanessa is also photographing and enjoying the beautiful sunrise. The contrast compared to the rest of the ground and the shape of the puddle help to guide you to her. But Vanessa’s reflection in the puddle makes it even easier for your eyes to jump from below to her and also to the rest of the upper part of the image. The reflection connects both parts of the image and emphasizes the main subject of the photo. 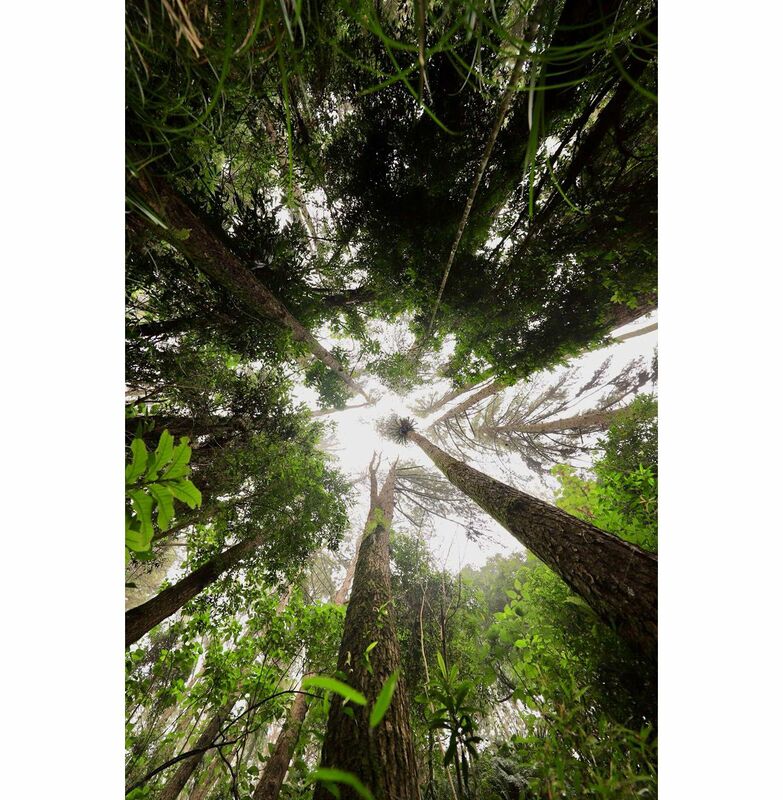 I’m also very happy to say that this photograph was selected to be at a photography exposition organized by SP da garoa in ALESP (Assembleia Legislativa do Estado de São Paulo), \o/ \o/ \o/. The exhibition will be open from April 16 to April 27 (2018) :). After that, I also made some more shots. I took advantage of the Belt of Venus at the opposite side of the sunrise to photograph the sky with different colors. 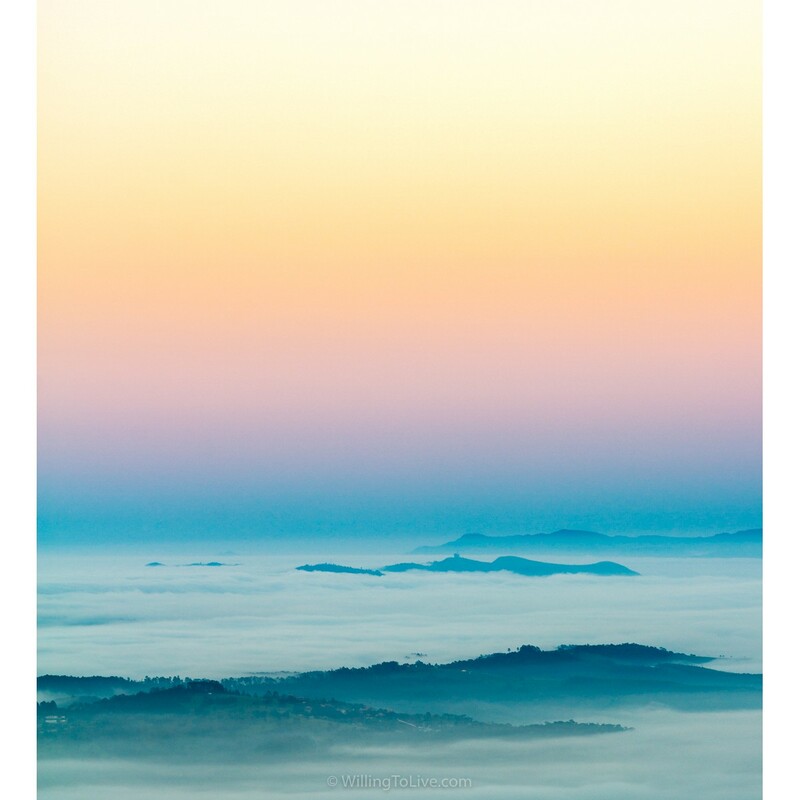 I also tried to capture the cloud inversion. After the sunrise, we also tried the trail that the day before was not possible to be done due to the rain. Actually, we just did the first part of it, the easier part, because it was getting too late and we needed to return to the hotel for our breakfast. But it was very nice, we saw the “big stone” for another angle, very interesting view. We spend about 4 hours and 30 minutes at Pedra Grande. Plenty of time to enjoy the stars and the sunrise. Then, it was time for a good breakfast and a nap to recover our energies to the final class of the workshop. The final class was nice too. Hugo talked about equipment, like cameras, filters, and tripods. He also talked about different lighting conditions, about the Belt of Venus, photography strategies, smartphone apps and many tips and tricks. To finish the class, he edited some of the photos he took during the workshop to teach us about post-production. Photography by Hugo Chinaglia. Do I need to say something? So great photography. At the end of the class, well, should I say or is it a surprise? Hum… it is a surprise :P. I think this way you will enjoy it more like it happened with us. I will just say that it is something personalized :). After the last class, we had lunch and it was time to go back home. It was an amazing weekend. After reading all this article, I think you have a very good idea on how your experience can be in this great workshop. We have lived many different situations, from day to night, from rain and wind to a sunny sunrise. This is nature, you can not control it. You can be the one that always complains or you can do better by finding a way to enjoy all of those situations. I’m sure we did the latter. This is also part of the learning process. In landscape photography we do not have the control, so we have to cope with many circumstances. It is part of the game :). Our friends also made the workshop even better. Very nice people, amazing life stories, very inspirational and relatable. Thanks for each one of you that were there that weekend. Photography by Hugo Chinaglia. There was no bad weather. They are willing to live. And you? It was just two days, but my sensation is that we have lived much more than that. It could have been just one more sunrise, but it was incredible. Besides all what I have lived and the great life experience photographing there, as a bonus, I even have a photo selected for an exhibition. That’s so awesome! Personally, this experience made me wonders to remember why I’m doing what I’m doing and why I’m completely changing my life to be surrounded by this kind of events and also helping more people to experience them. All those things also make me comfortable to recommend the workshop to other people. Why don’t you enjoy it too? Let’s do it! Just click the button below :). I want to attend Hugo’s workshop!